In 2018, GDP is estimated to have grown by 4% and was mostly driven by surging investment and growing exports. Employment increased considerably, but unemployment still remains high. The high government debt burden represents the largest challenge for policy-makers, which pursue an ambitious fiscal consolidation plan. 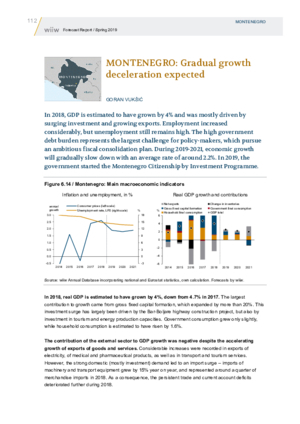 During 2019-2021, economic growth will gradually slow down with an average rate of around 2.2%. In 2019, the government started the Montenegro Citizenship by Investment Programme.